Cheese: delicious artisan cheeses from The Handpicked Foodstore, which included Farleigh Wallop Goat’s Cheese by Alex James (creamy, tangy, yum), Perl Las Organic blue (strong yet subtle) and a slow-baked Calabrian fig ball, which is an amazing accompaniment – I strongly encourage you to try it. I also picked up a nice stinky Brie de Meaux and a British cheddar to complete the set. 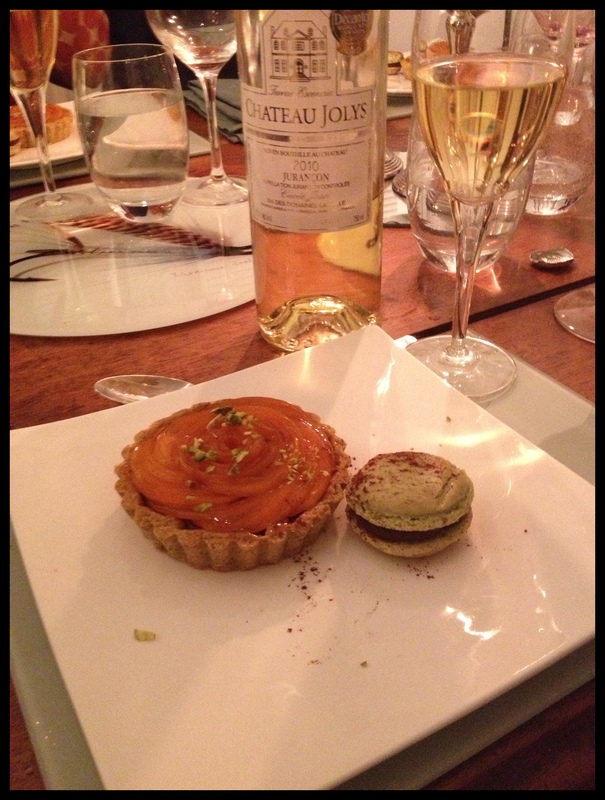 Pudding: Chocolate mousse tartlets on pistachio pastry, topped with glazed apricot and served with a pistachio macaron. So. Pudding. Now, I shan’t mislead you, dear reader. This was neither a straightforward nor quick pudding to make, but by goodness was it worth the effort. 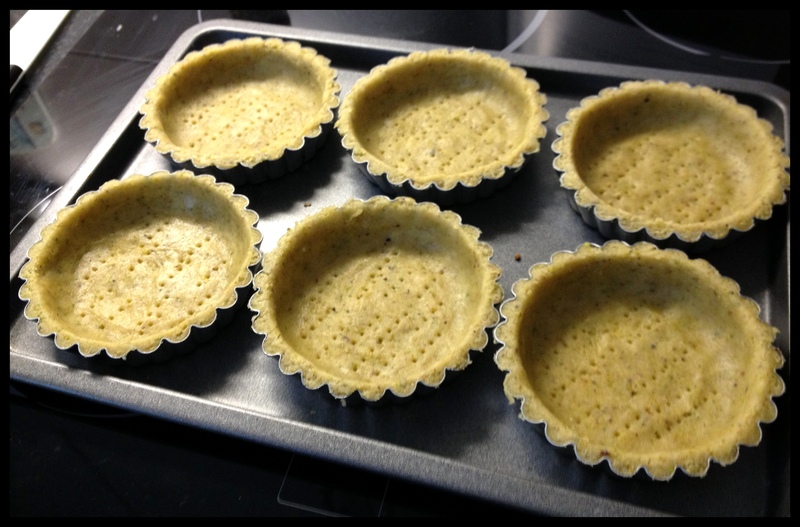 It all started with pistachio pastry cases. 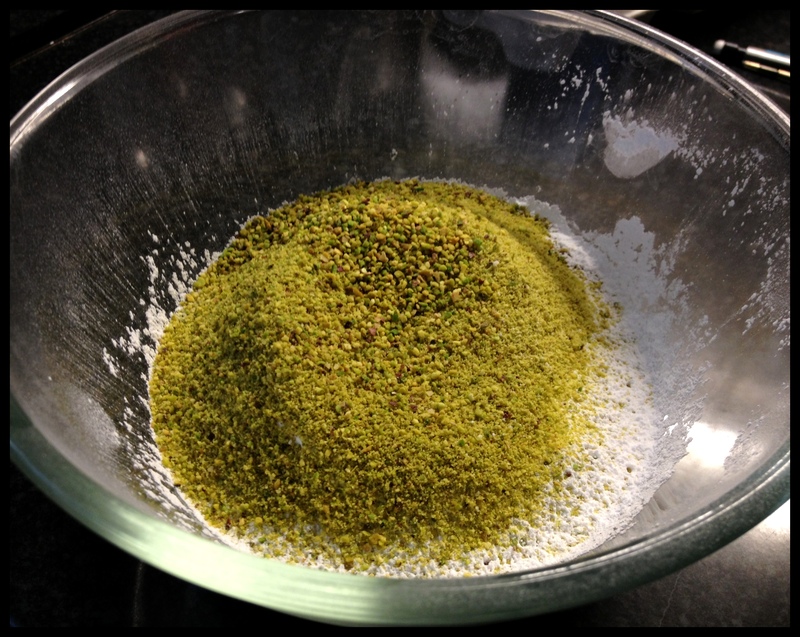 I don’t have a food processor, so I used the little bowl attachment for my stick blender to blitz the pistachios into dust, then combined them with the sifted flour and sugar, stirring them through with a fork. 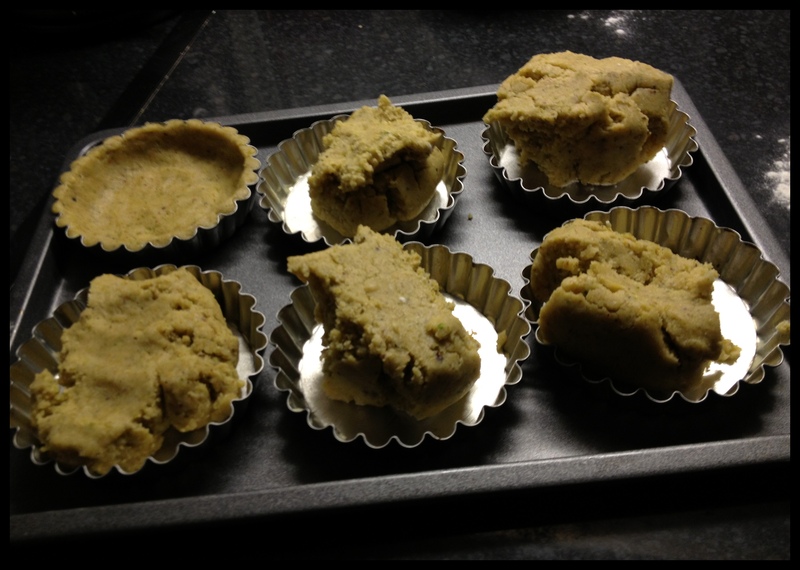 Then I started rubbing the butter into the dry mixture before blitzing it in small batches to make it a sandy consistency. I stirred in the yolk, then added the water a little at a time until the pastry started to come together. Once I had formed it into a bowl, I wrapped it in cling film and chilled it for an hour or so. Now, you’ll notice that I’ve prepared the work surface as though I planned to roll it out, which I did, but I realised very quickly that this isn’t the kind of pastry you can roll out, so I tore off chunks and pressed them carefully into the tartlet cases with my fingers, using a sharp knife to remove the excess that came up above the edges. 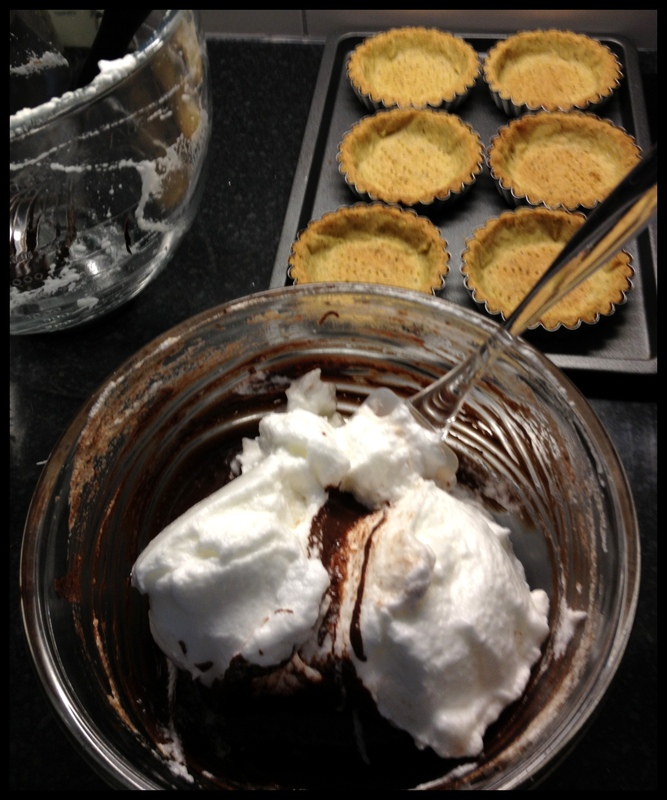 I tried to make the pastry fairly thin so that it didn’t overwhelm the pudding. 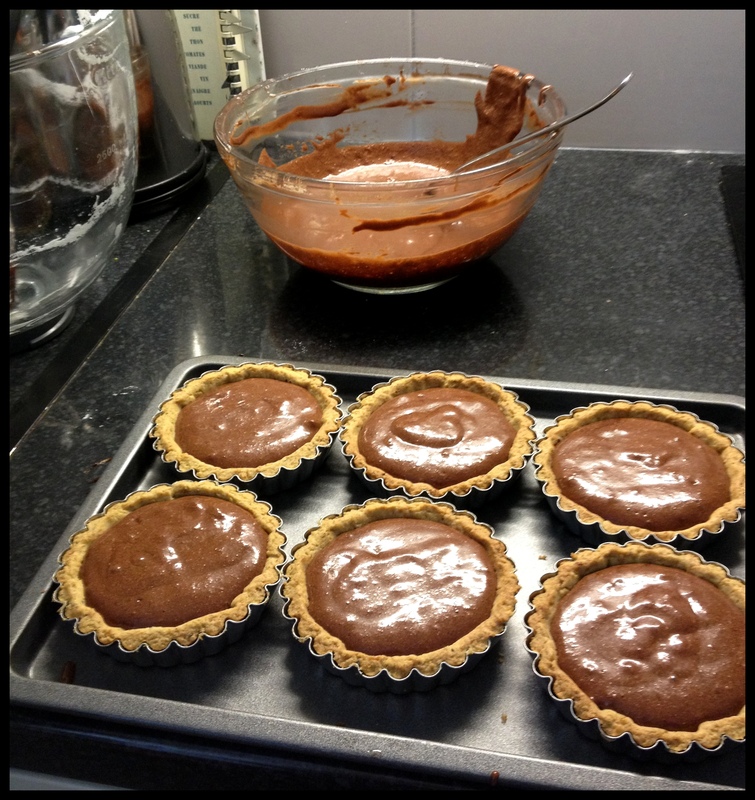 Melt the chocolate in a bain-marie, using a large bowl that will hold all the ingredients. Set aside to cool a little. Heat the milk in a small pan until it reaches boiling point, then pour it over the chocolate and gently combine with a small whisk. Add the egg yolk and stir through just until it’s incorporated. Whisk the egg whites to soft peaks, then hike up the speed and gradually add the sugar while it’s still whisking, continuing to firm peaks. 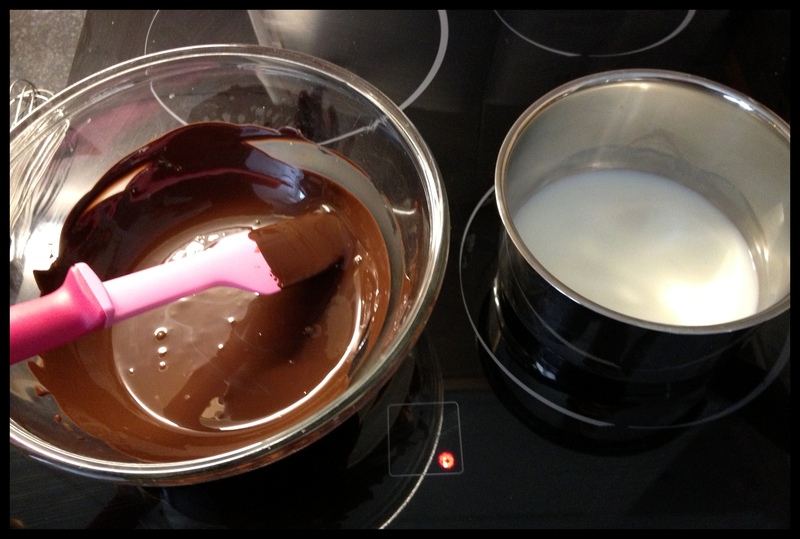 Add a third of the egg whites to the chocolate and beat in to lighten the mixture. 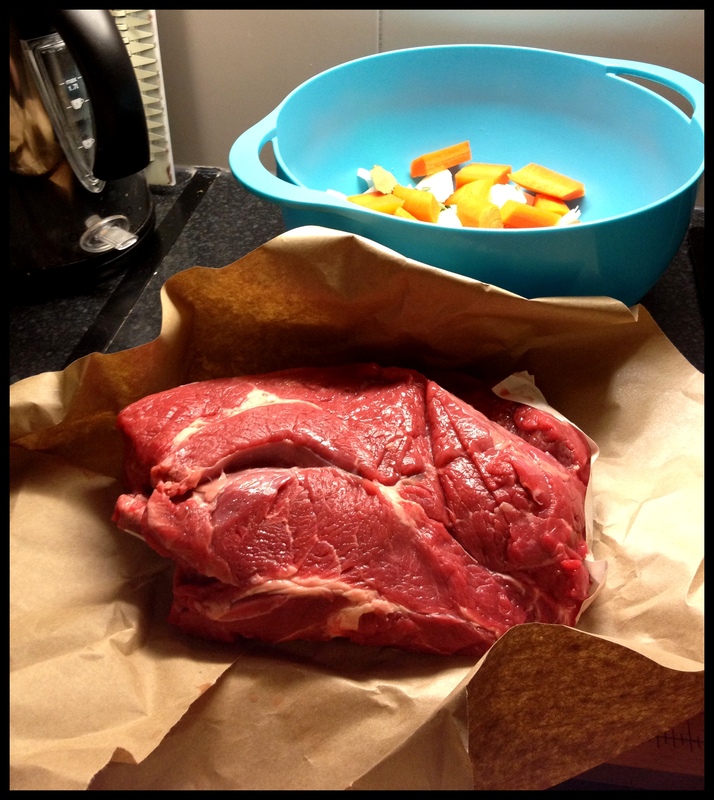 Then use a rubber spatula or metal spoon to fold in the rest of the white – be gentle and try not to lose too much air. 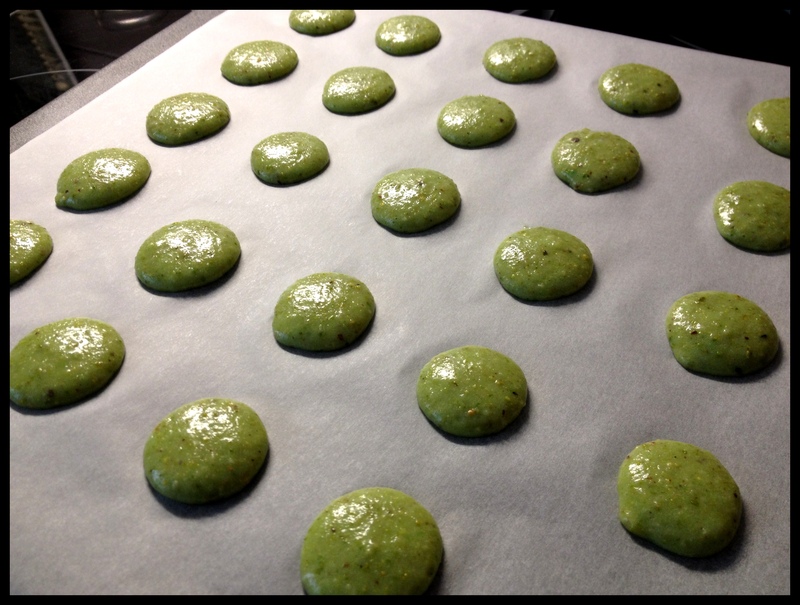 These went in the fridge for a few hours, so in the meantime I made the pistachio macarons. This was somewhat experimental as I didn’t find a recipe I liked online, so I adjusted Pierre Hermé’s chocolate macaron recipe and crossed my fingers that it would work. I made half a batch, which yielded about 32 (so 16 sandwiched macarons). 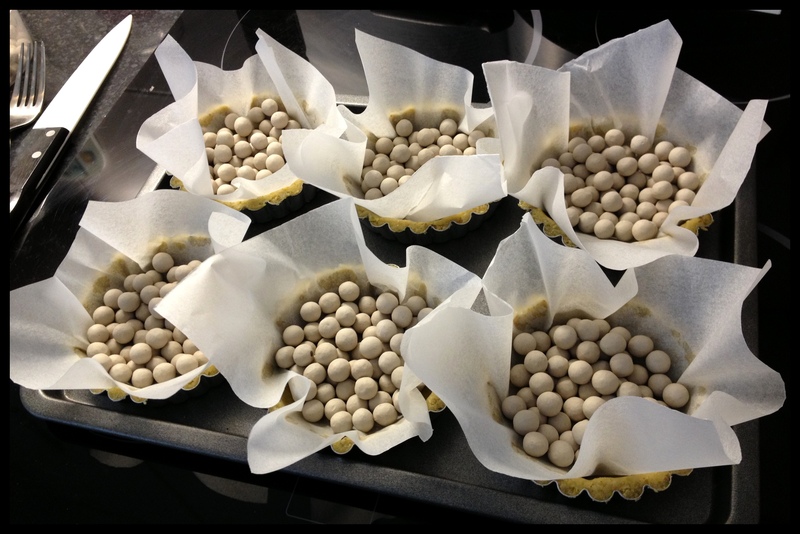 Line a large heavy baking sheet with parchment paper, and fit a piping bag with a 1-1½cm round nozzle. Set aside. In a food processor (I used my little stick blender arrangement again), whizz your pistachios and almonds for a good few minutes until they are really fine. Ideally, the bits need to go through a sieve. Sift the almonds, pistachios and icing sugar together. Carefully measure out your 50g of egg white, then whisk them up to medium-firm peaks. 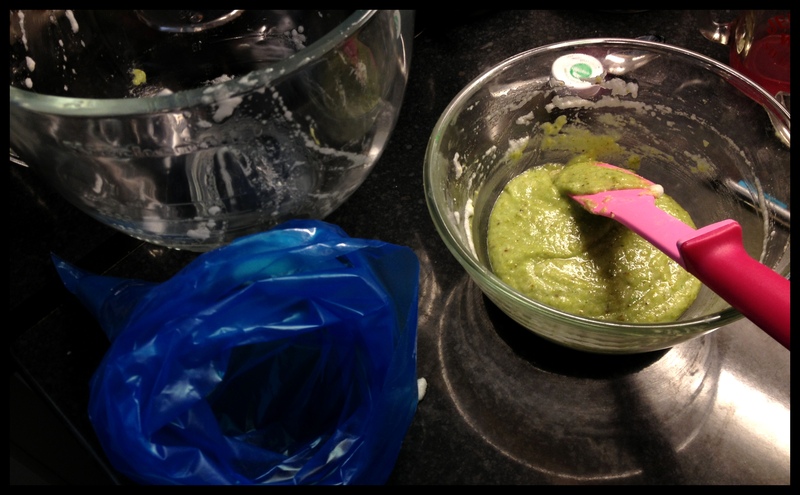 In 3 or 4 additions, use a rubber spatula to fold the egg whites into the dry ingredients, popping in the tiniest bit of green colouring with it. It will seem like there’s far too much dry stuff but it will work eventually. Don’t worry if it looks deflated and a bit runny – that’s good. It should look like cake batter. Use a little bit of the batter to stick down the four corners of the parchment paper (otherwise you’ll be battling to keep it down while you pipe). Pipe 2.5cm rounds, leaving 2.5cm between each. When you’ve finished piping, firmly grab the baking sheet with both hands and give it a good bash on the counter to get the air out of the batter. Leave the sheet on the counter for 15 minutes while you preheat the oven, which allows them to form a light skin before baking. Now, at this point Pierre and I have a small disagreement, largely because chocolate macarons don’t show browning from a hot oven but the pale green pistachio ones do. So, while Pierre recommends starting with an oven temperature of 220C, I wonder whether 200 might be more friendly but don’t believe me until I’ve had a second chance to make these. When the oven is up to temperature, pop in the baking sheet, immediately reduce the oven temperature (Pierre says 180C; I’m thinking maybe 150C) and stick a wooden spoon in the oven door to keep it slightly open. Bake for 10-12 minutes until the macarons are smooth and just firm to the touch. The macarons need to be removed from the sheet immediately and, because they’re sticky little buggers, you’ll need to get some steam under them to loosen them. Pour the tiniest bit of hot water between the parchment and the baking sheet, and tilt to distribute the water – you’ll be able to see it bubbling beneath the paper. Then use a fish slice or similar to lift each macaron and pop it on a cooling rack. Chop the chocolate quite small and throw in a bowl. Smush the butter and set aside. Bring the cream to the boil, then very slowly stir into the chocolate with a rubber spatula – the heat of the cream will melt the chocolate. 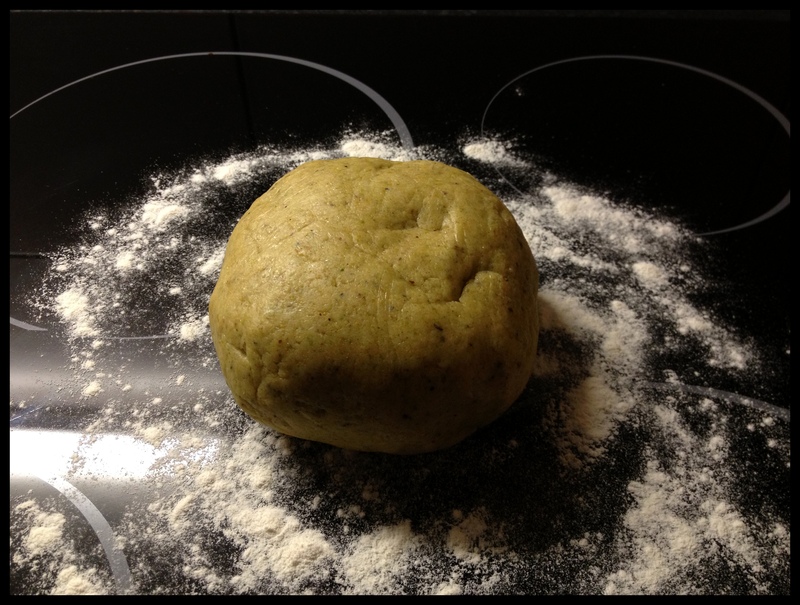 When the mixture is smooth, leave the bowl on the counter for a couple of minutes to cool a little before adding the butter in two additions, using the rubber spatula in circles widening slowly from the centre to the edge. When the butter is all in, you should have a smooth, glossy ganache. Chill it for about 15 minutes, stirring every 5, until it gets to piping consistency. Sandwich the macarons with the ganache. By now, the chocolate mousse should be nicely set. 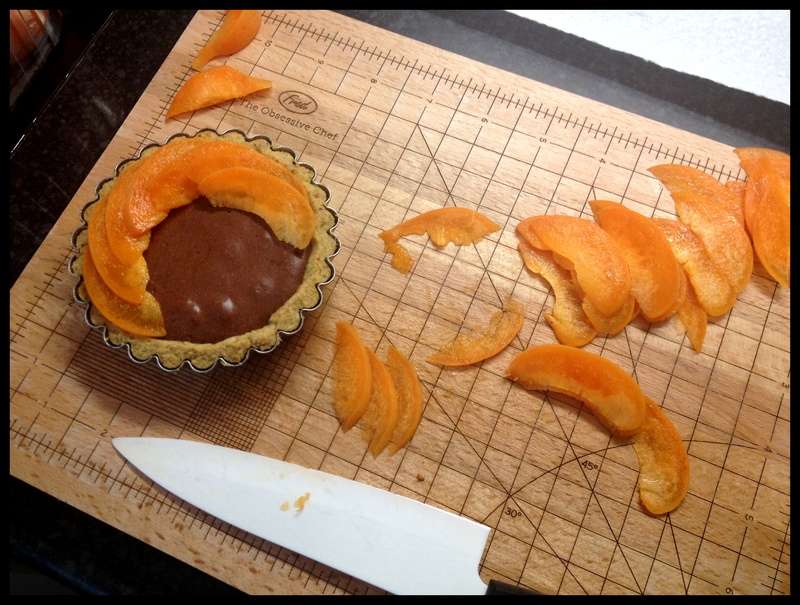 Allowing about 1-1½ apricots per tartlet, start to slice one at a time, as finely as you can. 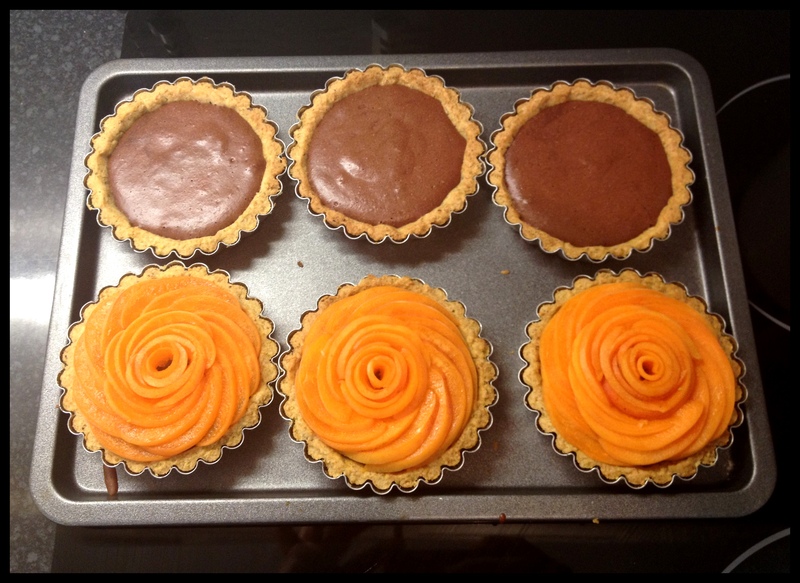 Bringing one tart at a time out of the fridge, lay the apricot slices on the top, starting at the outside edge and working in. When you’ve finished, heat a couple of tablespoons of apricot jam in a small saucepan and paint on with a pastry brush to glaze. Stick them in the fridge until you’re ready to serve. At which point, chop up some pistachios to sprinkle on top, and dust a little cocoa on the macaron (please try to ignore the dent in my macaron, where the cooling rack fell on it…). In an ideal world, serve with a lovely dessert wine (this one was particularly delicious and is available from Waitrose for an indulgent £14.49). This entry was posted in Cooking & Baking, Uncategorized and tagged chocolate ganache, chocolate mousse, glazed apricot, pistachio macaron, sweet pistachio pastry by wordspicturesandcake. Bookmark the permalink.